Tension can be adjusted so you can start where you’re comfortable and increase intensity as you improve! Designed to be small and compact to store away if needed. Train legs, hips and upper body muscles in one workout. Compact, yet powerful, the Andrew James Stepper Exercise Machine with resistance bands is the ideal solution to getting your cardio workout at home. We understand that sometimes you can’t get to the gym for your workout, but what do you do if your home is too small for fitness equipment? Enter the Andrew James Fitness Stepper. Although compact, it’ll give your legs, hips, and glutes a workout; toning and shaping every step of the way. 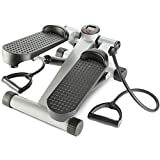 The textured foot pads on this mini stepper are manufactured from high quality materials allowing for enhanced grip giving you a superior workout. If you find it a little too easy (or difficult), simply adjust the tension of the stepper, until you find the ideal starting point. Unlike many mini steppers, this model makes it even easier to tone up and add another dimension to your aerobic training, with the assistance of the resistance bands included. Stretch high and reach for excellence with lateral rises, bicep curls, high pulls and more as the resistance bands help strengthen your upper body. We know there is nothing more annoying than losing those vital stats after a good workout!